My husband and I just recently celebrated our tenth wedding anniversary by taking a trip to Iceland. Since I generally don't like seafood, to say I was worried about what I would eat while I was there was an understatement. But I needn't have worried. We had many memorable meals during our time in Iceland, starting with a little nondescript hotdog stand on our first day that is apparently one of the best places to get a hotdog in the whole of Europe. Icelanders are wild about hotdogs, and Baejarins Beztu Pylsur down at the Reykjavik harbor has been serving hotdogs since 1935. 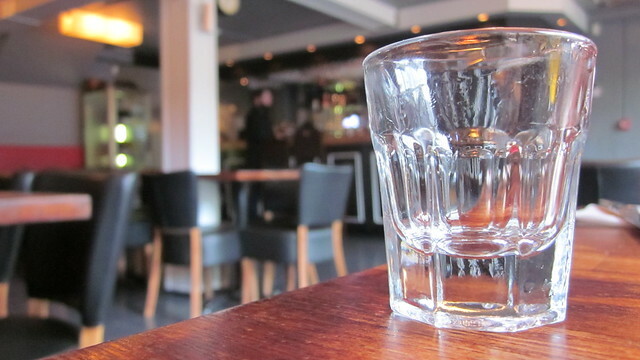 Brennivin is actually pretty good and doesn't burn going down nearly as much as other liquors such as Greek ouzo or Italian grappa. Though given that you're supposed to drink it after eating Hakarl, perhaps it would be better if it had burned going down. I imagine many people need their taste buds to be burned off after attempting such a feat of culinary bravery (or stupidity, however you prefer to look at it). 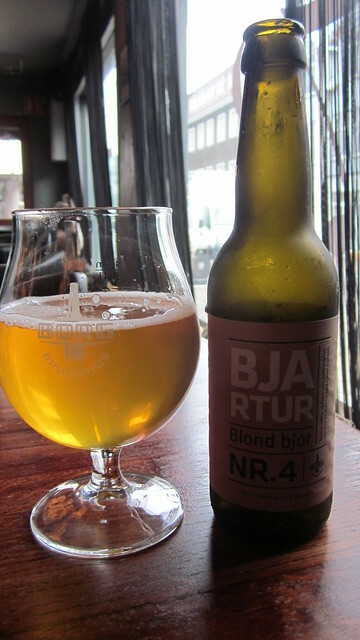 I also tried some Icelandic beer, which was also pretty tasty. This blond beer had a hint of orange in its flavor. It reminded me a bit of oberon ale. In fact, I'm going to be so bold as to say it was one of the best Indian meals I've ever had, eclipsed only by Vij's in Vancouver. 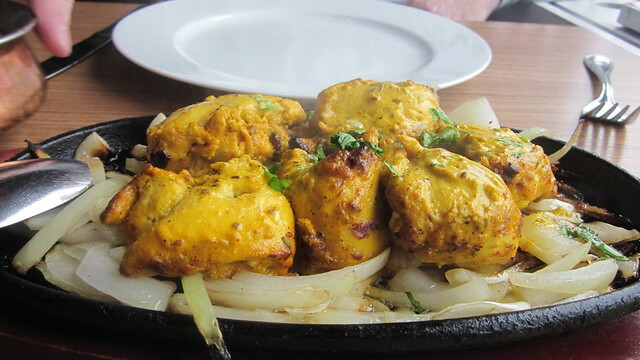 I ordered the Kozhi Mappas, which is a chicken dish with garam masala, coriander, turmeric, and coconut milk. 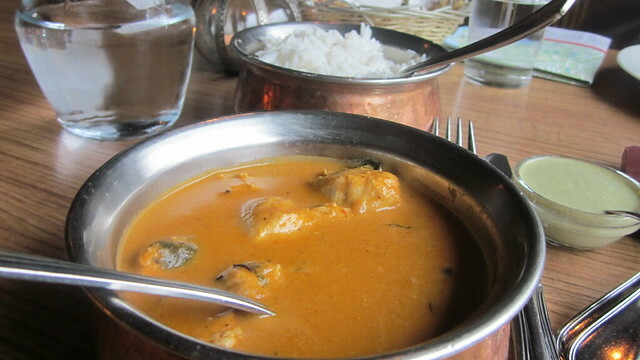 The sauce was the perfect combination of savory and sweet and had the most pleasing viscosity of any Indian sauce-based dish I have ever eaten. It's one of those dishes I will crave for the rest of my life, not unlike the torta ahogada at Xoco in Chicago. 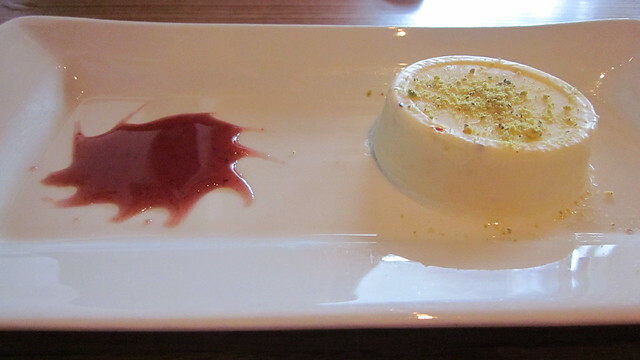 I loved that you could taste the flowery cardamom but it didn't overpower the dish because that is one spice that can get overwhelming quite easily. 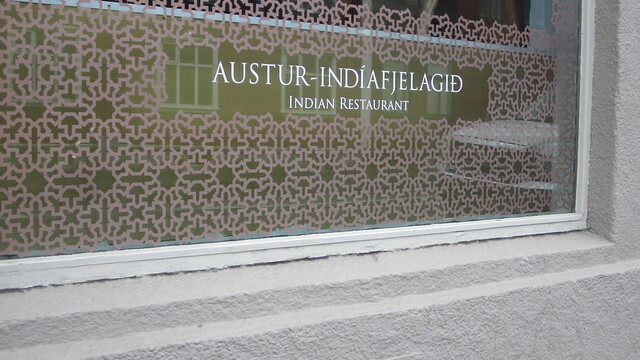 In fact, I'm going to be so bold as to say that I would return to Reykjavik just to eat at this restaurant again. It was that good. Another memorable meal we had was in a tiny village about 50 kilometers west of Skaftafell National Park called Kirkjubaejarklaustur (try saying that 5 times really fast). What was so memorable about this meal is that (1) the restaurant was very modern and had a fantastic menu for such a small village and (2) the menu had a nice variety of dishes but was still sophisticated and small. This is no easy task in a big city let alone a tiny village. The restaurant was called Systrakaffi and I will make sure to recommend it to anyone traveling to Skaftafell on their trip to Iceland. 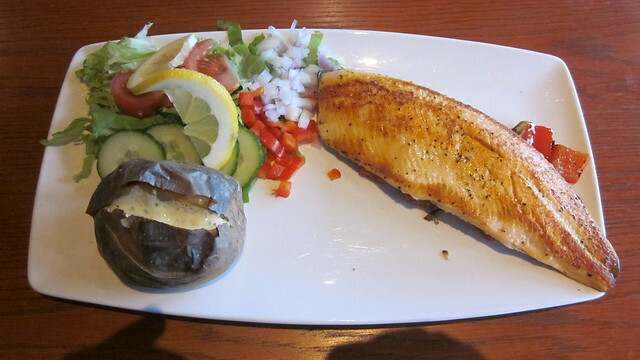 My husband ordered the pan fried Arctic char and for someone (me) who doesn't like seafood, I found myself actually wishing I had ordered this dish because it was so meaty yet had a delicate flavor. You could absolutely tell it was fresh and had been fished in nearby waters. Overall I have to say that I was pleased and surprised with the number of fantastic meals we had in Iceland, but I have to put the disclaimer out there that it would be extremely difficult to be a vegetarian there as 60% of their produce has to be imported and the other 40% of their produce that's grown in greenhouses even has to have soil imported from other parts of the world because theirs is so useless. Needless to say, I was starting to crave a giant salad by the time I left Iceland and even had to stop at Panera on my way home from the airport to order an Asian sesame chicken salad so I could get some green veggies in me. Still, I will look back fondly at my culinary adventures in Iceland, especially because I made sure to steer clear of the rotten shark. Icelandic hot dogs! Who knew? Glad you had a great time. I am an extremely adventurous eater but I'm not sure about rotten shark. But then I don't like fresh (non-toxic) shark. What a great post! I feel like I was there along with you. And hot dogs and beer and great Indian food in Iceland? Who would've have guessed. 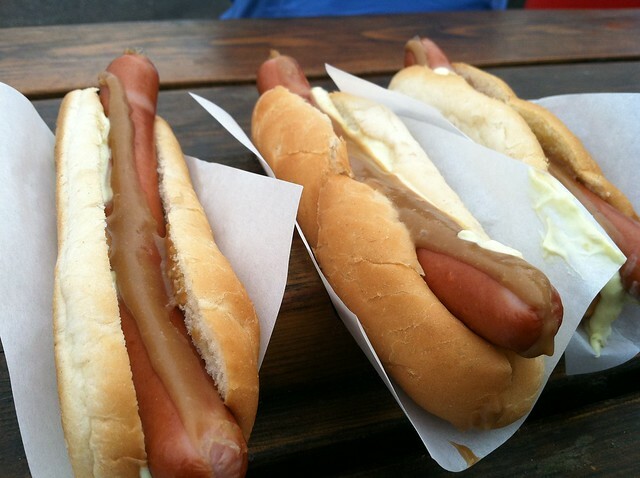 I know so little about Iceland and found this post very interesting -- hot dogs? Really? And I love Indian food. Glad you enjoyed the food despite your pre-trip doubts. Great information! I would have never guessed that in Iceland I would be eating hot dogs but not salads. I'd probably try fermented shark, especially with traditional spirits to wash it down. Iceland, eh? I think you are the first person I've known who has gone on a vacation there! It looks like you had a fabulous and wacky (rotten shark? really?) time! Here's my Saturday Snapshot and Weekend Cooking post. And hope you will stop by to enter my giveaway for the Literary Book Blog Hop, a $15 gift card to Book Depository! What a cool trip!! 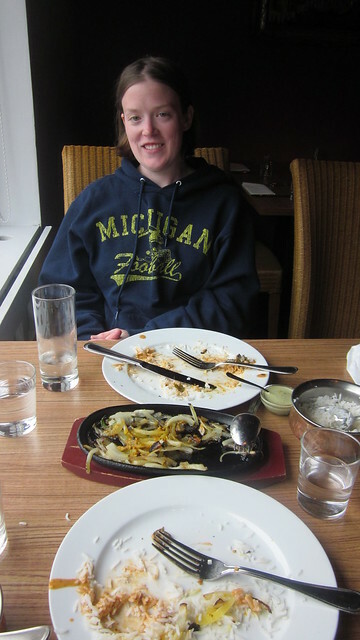 Love the food photos, you look like you are having a fantastic time! Thanks for sharing. I would have skipped the rotten shark, too! Your meals look delicious and I am going to be sure to come back to check out your recommendations if I ever find myself on a trip to Iceland. Thanks for sharing! What a fun adventure for your 10th Anniversary. It looks like you had some fabulous meals and experiences. Came across this post and I just got back from a week in Iceland and was very impressed with the food. 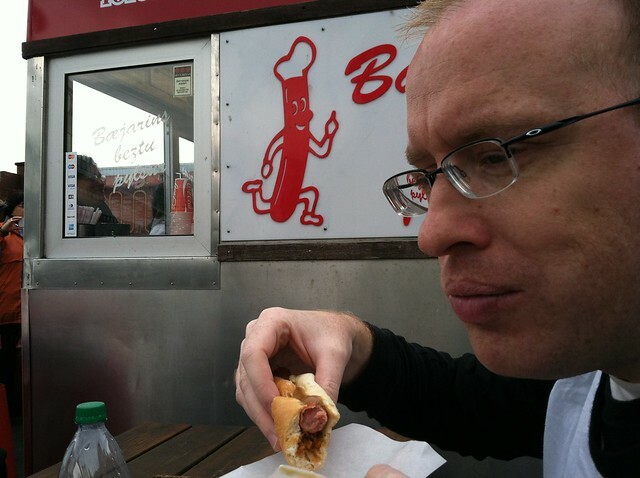 I already miss the hotdogs, I pretty much ate at least 1 per day. We also tried the minke whale from the Sea Baron in the Old Harbor and Smoked Puffin from 3 Frakkers. Both were better than I would have thought. I noticed many of the soups had a curry flavor and that there are many thai and indian places in Iceland, so I think both are popular.